A wishlist for govt schools: political parties, are you reading? With elections around the corner and all the political leaders sharing their vision for the state, we thought we at Makkala Jagriti would share our wish list for government schools in the state. This wishlist comes from the experience of working with government schools at grassroot levels. It is well-known fact that Holistic development of children is very important for making them well-balanced human beings and preparing them for life. ‘The National Curriculum promotes the holistic development of the child. It focuses on enhancing students’ spiritual, moral, social, cultural, physical and mental development; and thereby the overall wellbeing of the individual.’ Read it here. UNICEF and the World Health Organization (WHO) define life skills as an integrated set of critical thinking, personal and interpersonal competencies needed to manage daily life, difficult situations, conflict, and to contribute to the well-being of the community. Without life skills, literacy and numeracy skills lack foundation essential to leading a fulfilling productive life. 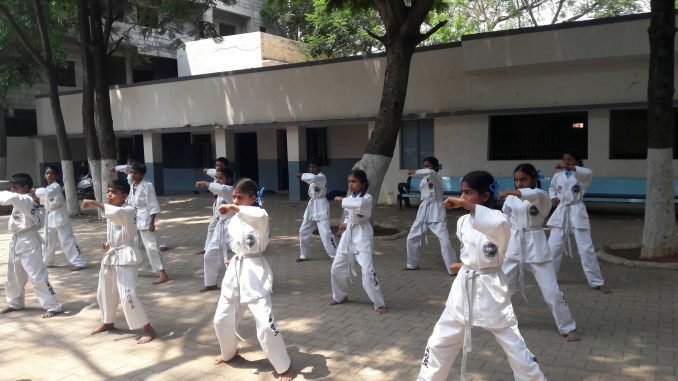 One of the ways to bring Holistic Development of children to schools is Makkala Jagriti’s model of creating a Holistic development learning center within a school, which is a tried and tested model for the 14+ years now. This learning center can offer a safe and non-threatening environment with activities focused on overall child development : Socio-emotional, intellectual, physical and creative development – through activity based learning, fine & performing arts, life-skills, sports, awareness sessions etc. For the joy of reading, every school must have a library set up with age-appropriate story books and magazines. It would be most ideal to have a small library in every classroom with books easily accessible to children. This not only builds a healthy and joyful habit of reading, but also encourages language development. The school must also subscribe to children’s magazines and newspapers and keep them accessible to children. All schools have library books or a library set up in some form, however we have found that when the offerings of the library changed from the boring biographies to colourful story books, also color coded based on reading levels, the response to the library increased drastically – almost every child wanted to read! In today’s digital age, there is no escaping from technology. A computer lab with e-learning materials and a qualified instructor to teach computers can ensure the children studying in government schools are in pace with the rest of the world. Often, we have found that those few schools with computers in the IT capital Bengaluru are dust-ridden for the lack of a trained computer teacher, rendering the lab useless. There are many model schools which have all of the infrastructure required, but nothing is reaching the children because no teachers are appointed to cater to those new labs! For the joy of learning science! A basic science lab in every school would go a long way in helping increase the conceptual understanding of Science. Training the science teachers in using the lab equipment is of course of prime importance. The importance of play and play-based experiences for a growing child is often underestimated. A playground in the campus or a tie-up with a nearby playground for regular use by the school is very important . Many schools do focus on sports- but this is restricted to the season of sports competitions. What we need is physical education focusing on all children and not just those few who represent the school in various competitions. The government has also defined a very good curriculum for physical development but often a qualified physical education teacher is missing. Where the school strength is less, one PE teacher or resource person can be shared between 2-3 schools. Everybody knows that creating a safe, functional environment conducive to learning is a basic hygiene factor for any school. However, many schools still have shortage of classrooms, dysfunctional toilets, no drinking water etc. This apart, it is very important to create a child-centric, non-threatening and safe learning space for children which enable them to learn well and develop holistically. We have seen that this is the most important factor that can make a difference for children to stay enrolled in the schools. The government prescribes 30:1 student:teacher ratio. Picture this – school has a strength of 120 students from class 1 to 7. The school is given only 3-4 teachers. How do these 4 teachers manage all the classes? 30:1 ratio is all right for a class, but becomes difficult when the students belong to different grades. If a class has more than 20 students, one teacher per class should be the minimum provision. Specialised teachers for each subject are another important requirement. The ultimate goal of any school should be to impart top quality education. Teachers are accountable for the effective delivery of the curriculum. This is only possible with empowered teachers – empowered with information, teaching-learning materials and the best teaching methodologies. Parental involvement is very important for every child’s development. Many parents especially from the marginalized communities think their role ends at enrolling and sending their kids to school. But the home environment also plays a huge role in the child’s overall development. In this regard, it is important to strengthen the process of involving parents. Regular meetings with parents at least on a quarterly basis focusing on different aspects and empowering them to support their child’s education is very important. In order to ensure the participation of the community and parents, every school has a School Development and Monitoring Committee(SDMC). While in the rural schools, the SDMCs are fairly empowered, the urban communities do not display a sense of ownership. Efforts have to be made to make the SDMCs in all schools empowered and exercise their powers and functions for ensuring that the schools are managed better and most of the issues relating to the academic aspects and developmental activities of the schools are addressed. None of the above can be achieved unless there is a strong leadership with a vision for strengthening education at every level – be it at the school, cluster or block level. Regular and continuous leadership building programmes for Headmasters, Cluster Resource Persons, Block Resource person and Block education officers are a must. We have often seen that a Head Master with strong leadership abilities can really turn around the school and make it truly sought after! This is a very doable wish list for all our government schools! Let’s make them vibrant spaces of learning where every child gets the best possible education and developmental opportunities. Recently, the Ministry of Human Resource Development invited suggestions for rationalising curriculum and content in schools with the objective of ‘all round development’ of students. We at Makkala Jagriti welcome this newer understanding that is emerging from Ministry of HRD. The government is finally paying attention to ‘all round development of a child’ , bringing on it the importance it deserves. It is time for political parties to come up with a plan in their manifestos to ensure all-round development of children. We wait for a day when the government schools are so exceptional that parents would fight to get a seat in a government school! Sunayana Chatrapathy is a resident of Bengaluru, who works with Makkala Jagriti as a Deputy Director.